Grant Mayer (22) gets the signal from the official (upper left) and teammate Chris Custis (8) celebrates a touchdown during last week’s game with Batavia. Once upon a time this season, Wilmington may have been favored in the week 9 matchup with Western Brown. Then, maybe the two teams could be considered even. After last week, the Broncos may very well be favored. Wilmington plays at Western Brown with a 7 p.m. kickoff for the SBAAC American Division battle. 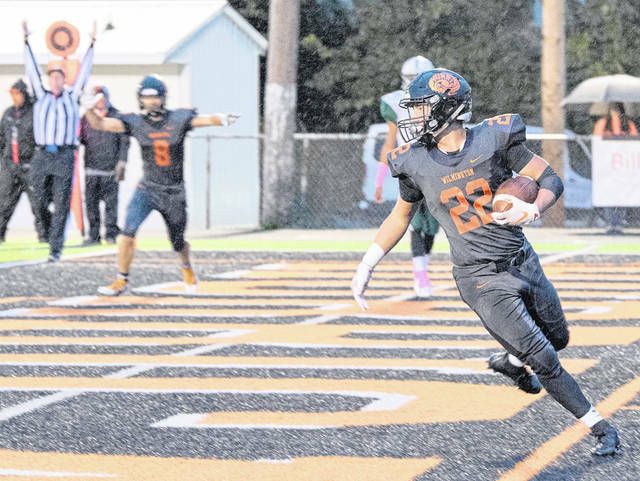 Western Brown pulled what may be considered an upset in Week 8 by defeating New Richmond 22-14, an outcome that ended the Lions six-game winning streak. Last week while Wilmington was rolling up 49 points on Batavia, the Bulldogs were putting 64 on the Hurricane defense. The Hurricane had 417 yards overall with 272 coming through the air. Brady Evans has thrown for 2,078 yards and 23 touchdowns this season. Cameron Coomer (50-839-11) is the primary receiver but Mason McIntosh (43-515-2) has come on as of late. Against Batavia, Wilmington had four receivers evenly matched in yardage totals so Evans is spreading the ball around. At Western Brown, their isn’t much spreading the ball around. Quarterback Josh Taylor is the main focus of the offense. Yani Williams (62-767-9) is the top pass catcher. But Taylor is a dual-threat player and maybe the top overall offensive player in the SBAAC. Taylor is the SBAAC’s leading rusher with 1,183 yards and 10 touchdowns on 181 attempts. As a passer, he ranks behind Evans with 2,039 yards. Taylor has 17 touchdowns on 167 of 291 passing (57.4 percent).